The MNHRC was established on 5 September, 2011 by Presidential Decree and formalised through the passage of the enabling law – the Myanmar National Human Rights Commission Law (MNHRC Law) – in March 2014. As outlined in previous ANNI reports, the Commission has suffered a public legitimacy deficit with concerns over the transparency of the selection process, the closeness of Commissioners to the previous military regime, a perceived lack of effectiveness, and lack of a human rights mindset. The GANHRI-SCA report of November 2015 did not accredit the MNHRC ‘A’ status which would denote full compliance with the Paris Principles. The SCA listed seven aspects of the Commission and its mandate that were problematic: a) selection and appointment, b) performance in situations of civil unrest or armed conflict, c) pluralism, d) adequate funding and financial independence, e) monitoring places of deprivation of liberty, f) interaction with the international human rights system, and g) annual report. In recent years, the MNHRC has made progress such as in prison monitoring and its engagement with civil society, and it has been open to assistance from international stakeholders. However, this progress has only been minimal in resolving the issues raised by GANHRI-SCA. The report will also examine the MNHRC’s response to the human rights situation in Myanmar today, including patterns of human rights violations and abuse since the establishment of the MNHRC in 2011. 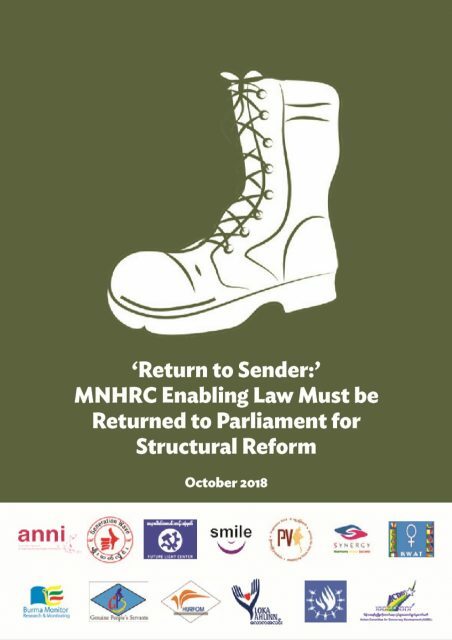 It will also analyse the key document that gives the MNHRC its mandate – the Myanmar National Human Rights Commission Law – and give recommendations for both legislative amendments and performance related operations. Download the report in Burmese HERE.